Ok, the first day out with the camera. 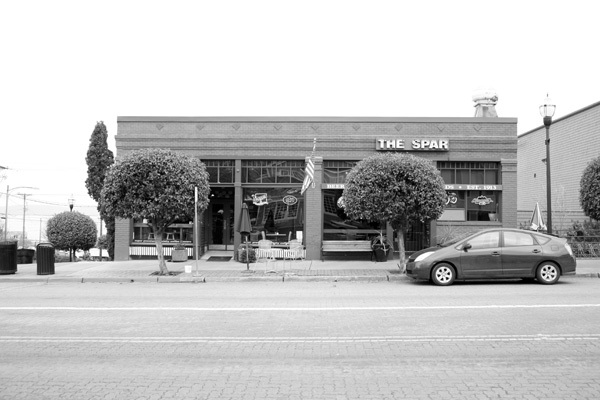 While I had accrued a list of places to start with, from basic scenes to some complex requiring front controls, I settled on a favorite cafe and tavern, The Spar in old town Tacoma. It's a one-story building with easy access to setup to learn the basics. I could setup in a small parking lot across the street and get a straight view of the front of the building. The first question, why? Because you have to become familar with handling the equipment and the basics of setting the camera up to the point you're ready to insert the film, set the exposure, shutter and aperture, and take a photo. There are a lot of small things you have to learn just to get where you can start using the front and back controls. The obvious is to view the spot you want the image. Everyone has their tools to do this, I used my Canon 5D with a 35mm lens, 5D's monochrome image above, since I'm using a 120mm f5.6 lens	with the Horseman camera. There is a slight difference in the view, but for now, not enough to worry about because you can always move the camera for the final setup. I also had one of those	"composition" cards but found the 5D easier. Once the tripod and camera were leveled and setup with the lens, the rest is the normal process of focusing, which I found easier with a 4x loupe on the ground glass without a dark cloth than I had read or heard, determing the exposure, setting the shutter and aperture, inserting the film holder, with T-Max 100, setting the lens for the exposure, remember to test it, removing the film cover, and then click. All that work for a 1/4 second of work. It was an overcast day with the sun coming in and out behind the clouds. And the shadow at 11:00 am was moving down across the sidewalk into the street in front of the building. With the sun out I got a 6 stop range and a 3-4 stop range without. So I set it for the road and shadow and set the shutter one stop fast to take the shots when it was covercast. So, the result? I won't know until the lab process the film, but I have some more to take to get the minimum they want to process film. But the rule is, take lots O' notes to remember when things go, "Huh? ", or worse, "WTF?" I don't expect so as I took some digital shots to to cover the range. And so the real obvious, was it worth all the research, time, and money? Does, I could do this the rest of my life answer the question?